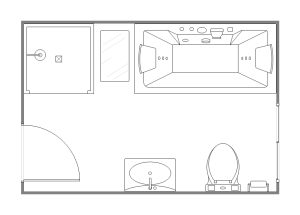 Edraw offers you a number of ready-made bathroom plan templates which you can use in your drawing and free. Edraw is used as a bathroom plan software coming with ready-made bathroom plan templates that make it easy for anyone to create beautiful bathroom plan. The bathroom plan templates are easy to use and free. Edraw is compatible with Microsoft document, it can convert all these templates into PowerPoint, PDF or Word templates. Creating a bathroom plan in Edraw is easy. It only takes a few seconds to choose a basic template, add furniture, and adjust the layout. Use bathroom floor planner to create your bathroom designs now! If you want to use a ready made template, go to bathroom plan templates page and choose the Bathroom Plan that best suits you. 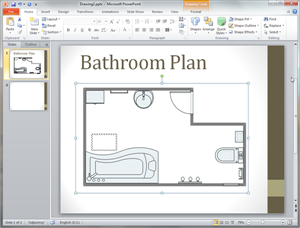 When you finish creating your bathroom plan in Edraw, one click on the Export button will transfer your drawing into MS PowerPoint presentation. You need to consider few things when creating a bathroom plan that helps configure your bathroom. In order to save the template as a design template, you need to download Edraw and edit it. Easy to customize the templates and change the color, theme and effect. 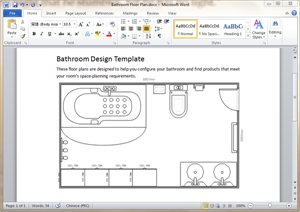 Simply clicking on the Export PDF button will convert your bathroom plan template into PDF. 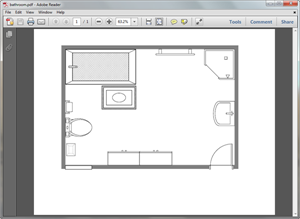 You can view the PDF Bathroom Plan Template to view the quality. Your dream bathroom plan is now just a click away. Compare your options and plan the perfect layout, find inspiration, explore finishes and mix and match bathroom appliances to get the perfect result. Become your own bathroom designer with the help of Edraw Bathroom Plan Software. Thanks to our easy-to-use software, you can choose windows, doors, and appliances such as toilets, sinks, and bathtubs to fit the exact measurements of your bathroom. Get started with existing template from Edraw. When you're ready, either print out your drawings or export and share with different format of documents. Discover why Edraw is an excellent program to create bathroom plan. Try Edraw FREE.